Ecology is a fascinating subject. There are several definitions but it basically means the study of how living things interact with each other and the surrounding environment. Interactions is the key word in this definition and this is what makes ecology a complex and interesting field of study. It's relatively easy to study one organism and how it reacts to one or two variables in a controlled environment. But how do you measure different organisms from different species in different environments? It may seem impossible to account for all the variables but progress is being made. For example did you know that willow trees depend on wolves? About 100 years ago, wolves were hunted out of existence in Yellowstone Park in the Wyoming. Wolves were perceived as a threat to cattle ranchers. Wolves also considered elk and deer as, well... lunch. To us humans deer resonate as simple, beautiful creatures (the Bambi syndrome) while wolves are ravenous marauders. When wolves were removed, deer populations began to multiply. In order to feed themselves they ate everything they could find including young willow saplings. Eventually willow trees began to disappear. Wolves were reintroduced in the 1990s and quickly began to control the deer population. When that happened willow trees began to make a comeback. Having wolves around allowed willows to grow. This ecological connection wasn't recognized until the natural balance was restored. This is a long introduction to the current topic, the Trout Lily (Erythronium americanum). This is a spring ephemeral that grows abundantly in the forests of the Don Valley. Spring ephemerals are a group of forest plants that appear early in the spring and complete their life cycle before the leaves of the forest canopy shade out the forest floor. It turns out that these lilies actually help maple trees to grow. Apparently they provide nutrients to the trees by passing them through their roots to the roots of nearby trees. How is this accomplished? A little known group of fungi that live in the soil called mycorrizhae form symbiotic associations with the lilies. They wrap tiny filaments called mycelium around the roots of the lilies. The fungi collect water and elements like nitrogen and phosphorus and pass them on to the lily. In return the lily feeds the fungi sugars and carbohydrates that they produce by photosynthesis. Through this mutualistic relationship each organism benefits. It turns out that these mycorrizhae can link several species at the same time. 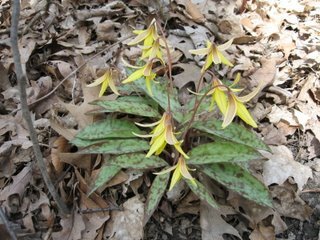 Scientists were able to track carbon molecules that originated in Trout Lilies that ended up in nearby Sugar Maple (Acer saccharum) saplings. The carbon moved through the mycelium pathways in the fungi. This process allowed the maples to get a jump start on the growing season. They measured the growth of Sugar Maples with a connection and without. The connected maples grew significantly more than the unconnected maples. Trout lilies also have an unusual ability in that they experience root growth in the fall. There is some evidence that they receive nutrients back from the maples to aid their own root growth. So you can see how this ecological study provided new insight into the workings of our forests. Through studies like this we gain a better understanding of our environment and a deeper appreciation of the interconnectedness of our world. P.S. For anyone interested in the study being referred to, here is the complete reference. Lerat, S., Gauci, R., Catford, J.G., Vierheilig, H., Piché, Y., and Lapointe, L. 2002. 14C transfer between the spring ephemeral Erythronium americanum and sugar maple saplings via arbuscular mycorrhizal fungi in natural stands. Oecologia, 132: 181–187. Posted by Donwatcher at 10:24 p.m. Fascinating story, DW. You seem to have a wide range of interests - from science to policy planning. Keep up the good work! P.S. And I like your pictures too! Experimental evidence reveals that an invasive species in North America--garlic mustard--negatively impacts the growth of native tree seedlings by disrupting native mycorrhizal mutualisms. Thanks for the tip. In fact we just discussed this article at the Habitat Restoration team, although there is not much we can do about it. As you know the stuff is all over the Don. Don Watcher is still thinking about what to say about this topic but I'll certainly put in my two cents worth at some point. This is a very interesting website (plosbiology.org) and easy to understand even for neophytes like me. Thanks for sharing the info. What needs to be fixed in this city?